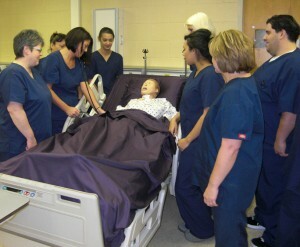 Atlantic Specialty Care has introduced a new more efficient training program to certify nurse assistants (CNAs). Located in Atlantic, Iowa, this skilled nursing facility provides outpatient, short-term and long-term care for patients. In the past 5 years they have received the American Health Care Association’s (AHCA) “Bronze” and “Silver” Commitment to Quality awards, the 2013 and 2017 AHCA Quality Initiatives Award, and the 2016 Iowa Governor’s Quality award. Not long after the first class, Julie Adair with the Iowa Health Care Association (IHCA) approached Jimerson with an opportunity to be part of a pilot program, CNAOnline.com, that blends coursework completed online with in-person, clinical labs. “We jumped at the chance,” Jimerson said. “With CNAOnline.com’s approach, we don’t have to wait until we have a certain number of students in our building to hold the course,” Jimerson said. The course work is run by an independent instructor provided by CNAOnline.com and each student accesses the class using a tablet or smartphone on his or her own time. Only a few days are necessary for in-person lab work. “CNAOnline.com has an extremely user-friendly process, and made it so easy for us because there was always somebody to help us every step of the way,” Jimerson said. Julie Adair with IHCA helped the facilities get certified to allow each location to hold the clinical labs in their buildings. Jimerson says local newspaper ads and area high school administrators are helping to spread the word to future caregivers. “The biggest perk is the program is fully paid for by the facility and the students get paid for their time in clinical labs,” Jimerson said. “This is a great program for facilities who don’t already have a CNA training program and don’t know where to start,” Jimerson said.